Because our core business is helping high-risk merchants like FFL dealers with payment gateways and merchant account recommendations we often are told about new software solutions. Lately, clients have been mentioning a new platform for both current and prospective FFL dealers in the US. AmmoReady is a quick set up, easy to run, FFL storefront and back-end software for high-risk e-commerce professionals and newcomers alike. With AmmoReady you’ll have a mobile-friendly storefront that boasts extremely useful features, such as automated distributor catalog synchronization. This platform makes it is easy for customers to find you, and it always keeps your product availability up to date. Another significant benefit of AmmoReady is that it’s compatible with Authorize.Net. As you may know, Authorize.Net is one of our preferred high-risk payment gateways for FFL to FFL sales. While we often recommend Authorize.Net, we also have considerable experience helping FFL dealers obtain a merchant account suitable for selling FFL products. 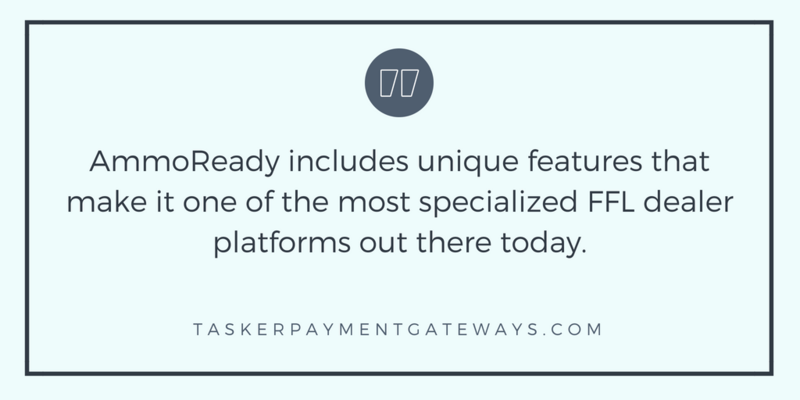 At TaskerPaymentGateways, we want to go the extra mile. This means that after you obtain a merchant account, we can help you integrate your FFL online store with Authorize.net – allowing you to charge credit cards or accept other popular means of payment. Feel free to use our contact form to get in touch. We’re always happy to help, even if you only have a question or two! Connects with most providers (including Sports South, Zanders, RSR, Bill Hicks, and more). Dropshipping feature for firearms, ammo, and accessories. Avoid double shipping payments, send straight from warehouse to your customers nearest pickup location. Extensive recordkeeping, alerting you to suspicious activity and providing a “threat level” on every order. While this list only covers a few of the available features, it does highlight how specialized and useful AmmoReady is for business owners in the firearms industry. Dropshipping, for example, is an excellent way for both retail and home-based FFLs to save money on shipping. Drop shipping also addresses limits when it comes to inventory space. When it comes to firearms sales, chargebacks can be one of the most pressing concerns. This platform helps to significantly mitigate chargebacks, which is a chief concern for your bank and merchant account as well. AmmoReady is also compatible with many online services like GunBroker.com and Gun.Deals. This can increase traffic to your site and make setup a great deal easier. Drop shipping does add a level of concern at the merchant account providers side through, so please make sure to contact us before setting up your FFL store so we can help you do it correctly. As mentioned above, we have years of experience with Authorize.Net. This allows us to easily help you integrate the payment gateway with your federal firearms AmmoReady web-store. With our connections, resulting from years in the industry, we can also help you find a merchant account that fits your business like a Brownells magazine in a Bushmaster. More often than not, we can find you a merchant account for a better deal than you’ll find on your own. Simply put, we want to make credit card processing as easy as possible for you. If you need payment processing as soon as possible, fill out the form below and get in touch! AmmoReady will give you some excellent and necessary tools when you sign up. You’ll receive a current SSL as well as gain access to all the best modern SEO tools. Having a safe website is paramount for online high-risk e-commerce. These tools will help you attract customers in a heavily regulated field. Due to these regulations, you need to be careful what you put on Social Media and other highly visible platforms. While we’re at it, please make sure to check your local, state, and federal laws before you start your business. Remember, sales across state lines is an exceptionally tricky thing to take on. Moreover, it may not be legal for you in your location. We recommend that you speak with an attorney or legal expert when starting out in this high-risk industry. Knowing where you stand legally will help you deal with many aspects of running an online FFL store. Technically, you don’t NEED an FFL to use AmmoReady. However, you will need one if you plan on transferring or selling FFL products. This includes firearms or specific accessories. After all, the sale of FFL products really is the primary purpose of the AmmoReady platform. You get what you pay for, and AmmoReady is not free. However, they won’t charge you a predetermined, set, monthly charge. Instead, they opt to charge a low monthly fee based off your orders and any extra add-ons you have installed on your site. In addition, you won’t be limited to the inventory options of the live product feed from distributors like Sports South. On the contrary, you can list your products in addition to anything that comes through those feeds. This will make your web-store extraordinarily versatile and increase your potential for profit. Another big perk to AmmoReady is the high-end support for the platform. They will monitor your website 24/7. There’s also an easy to use in-app chat during regular business hours for quick help when you need it. This practically eliminates having to wait hours on end for an email or being on hold on the phone, to fix both small and large problems. There’s also email support for off-hours help. They will even offer to help you in the start-up phase and assist in setting up your web-store. We’re pretty excited to see well-built, all-in-one FFL platforms pop up! Feel free to contact us with any questions or to get started today accepting credit cards on your AmmoReady FFL site today.